Thursday November 9th 1893 Will put up the stove in dinning room in the morning. I blacked it, did my work and went up town. Edith was here for dinner. I washed the storm windows for the front of the house in the afternoon and raked the yard. Will was disappointed in help and work hard to accomplish nothing He put a gate between ours and Borlines yard. Friday November 10th 1893 I worked a little more in the yard in the forenoon and washed the parlor windows. I took the lace curtains down to brush them. In the afternoon I changed things in the dining room and little room. Will brought the piano our for me. He was hauling hay for Mr Halson. Mary & Jennie called. 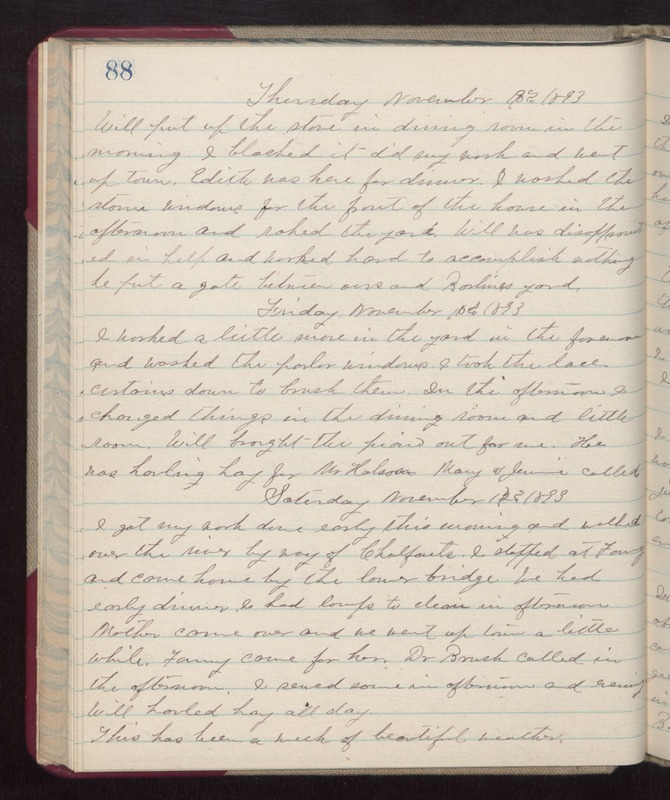 Saturday November 12th 1893 I got my work down early this morning and walked over te river by way of Chalfants. I stopped at Fannys and came back by the lower bridge. We had early dinner. I had lamps to clean in afternoon. Mother came over and we went up town a little while. Fanny came for her. Dr Brush called in the afternoon. I sewed some in afternoon and evening Will hauled bay all day. Thus has been a week of beautiful weather.